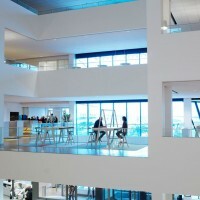 Architecture firm Tengbom have designed the new headquarters for Vattenfall in Solna, Sweden. 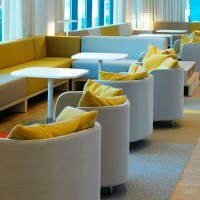 Tengbom in Stockholm has recently designed the interiors of Vattenfall’s new head office. 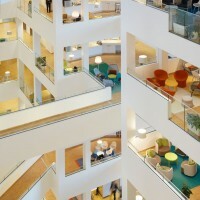 It is located in one of Sweden’s most energy efficient office buildings in the Arena City in Solna. Vattenfall’s over 2,000 Stockholm-based employees have previously been based at three different locations in the Stockholm area but the new premises gather all of them under one roof. As a proof of the success of the first objective, the building has been awarded the Green Building Award in Sweden and in the EU. Vattenfall’s vision was for the building to act as a campus that promotes natural interactions and enables cross-generational skill transfers. The new office consists of four buildings linked by a connecting atrium. The colour scheme of the project is based on the four elements, earth, fire, wind and water, which are expressed in the office spaces of the four different buildings. Tengbom connected these four elements to Vattenfall’s main areas of business, natural resources and the different types of energy sources under the Vattenfall umbrella. The fifth element, ether, represents communication and meetings. 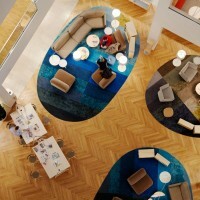 The heart of the office is the atrium, where there is movement and bustle. People stop for coffee and a chat when they bump into up each other, or arrange informal meetings. On the ground floor of the atrium there is the common cafe and “living rooms” on either side of the stairs, designed as bleachers with cushions and tables. The atrium is white with a natural wood base. Accent colours on the soft furnishings add depth to the interior and match the Vattenfall colour scheme to create variation and direction. Adjacent to the entrance there is the external conference area with a capacity of 400 people. 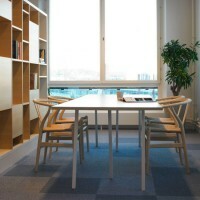 The A-series conference tables, designed by Tengbom for SA Möbler were used in all meeting rooms. One of the unique things with these conference tables is that they are made of solid ash from Skövde. The open plan offices are placed separately from the atrium, thereby making the workspaces quiet zones without unnecessary interference. All employees have their own workstation. 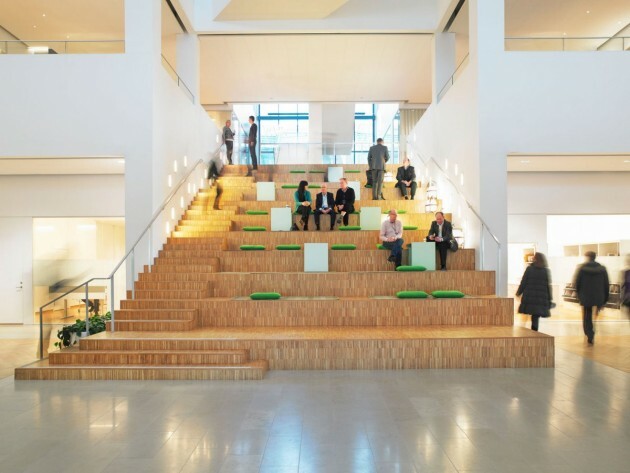 The surfaces of the building are also over 2,000 alternative seating for meeting, working and relaxing. Vattenfall had very specific requirements for the desks. They did not want to settle for the traditional rows of desks with clusters of four. 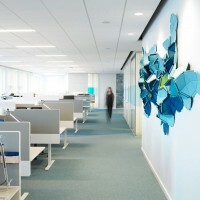 They wanted their new offices to be more alive and organic. The work stations have therefore been designed by Tengbom and are specially developed for Vattenfall, manufactured by Ragnars. The shape is based on the work desk positioned at a 90 degree angle to the double sided storage unit and is staggered so that a single desk can be placed on either side of the storage unit. The idea is to allow free placement in the room. The new office also offers an in-house wellness centre with sports hall, gym, spinning bikes and a full time chiropractor.